Ugo Mulas, "Lucio Fontana," 1964. Gelatin silver print on baritated paper on board. The series of paintings known as Concetto spaziale, by the Argentine-Italian artist Lucio Fontana, is one of those moments in art history whose significance is easily overlooked today. It is difficult to imagine how radical they must have looked during the 1960s: plain white canvases presenting nothing more than one or a few slits where Fontana slashed the surface with a blade. Moreover, as I realised when I reviewed an exhibition featuring Fontana in 2015 (you can read that review here), it is only by considering the atmosphere of post-war Europe that one can grasp how freighted with purpose and symbolism this simple gesture had been. But there are always new ways of looking at an artwork. The other evening I was visiting some galleries near Piccadilly and found myself, unexpectedly, confronted by one of the Concetto spaziale paintings once more. Only I wasn’t looking at the painting itself, but at a series of photographs that showed Fontana in his studio making it. Where previously there had been the stark aura of an iconic artwork, now there was melodrama and a rye sense of humour. The images, taken by the Italian photographer Ugo Mulas, were arranged in a climactic sequence. First we see Fontana poised at some distance from canvas, Stanley-knife in hand, his tense wrist and neatly folded sleeve suggesting the commencement of a long-anticipated act. There is a mood of ritual silence in the room, heightened by the soft light pouring through a large window. 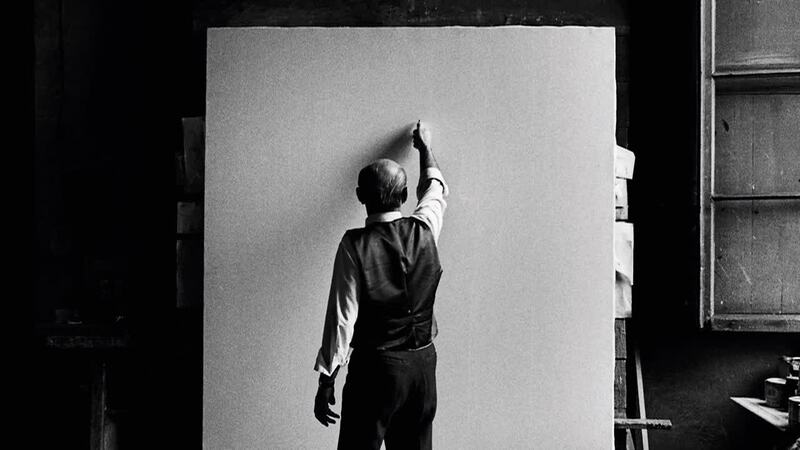 Then Fontana is approaching the canvas uncertainly, and making the first incision on its white surface – a moment pictured first in wide-angle, then close-up. Finally, the deed done, he lingers in a ceremonious bowing posture, the canvas now divided by a metre-long cleft. Installation shot of Ugo Mulas, Lucio Fontana, L’Attesa, Milano 1-6, 1964 (2019). Modern print. Gelatin silver print on baritated paper. Edition of 8. Courtesy of Robilant+Voena. 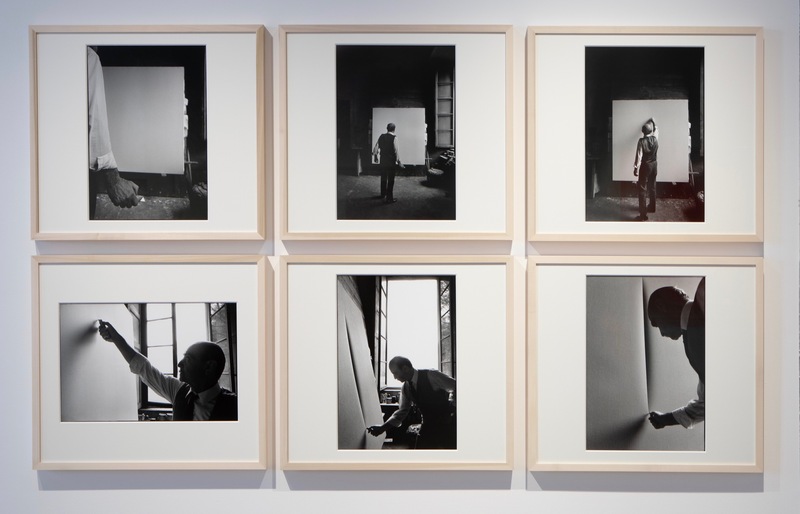 These are just some of the photographs Mulas took of artists in their studios during the 1960s and 70s, which can be seen at Robilant+Voena gallery on Dover Street. Much like Fontana’s paintings, Mulas’ photographs require one to step imaginatively backwards in time; they now appear so classical in style, and so gorgeous in tone, that one can overlook their more subtle aspects. In particular, I get the sense Mulas was aware of his role as a myth-maker. His images playfully pander to the romance surrounding the artist’s studio – the setting where, in the popular imagination, unusual individuals go to perform some exotic and mysterious process of magic. I have always been fascinated by studios, probably because I grew up with one at home. This was my mother’s studio. It was located between the kitchen and my brother’s bedroom, but I was always aware that it was a different kind of room from the others in the house. A place of inspiration, yes: a realm of coffee, bookshelves, and classical music. But also a site of labour, which smelled of turpentine and had a cold cement floor, a place where my old clothes became rags to wipe etching plates. Above all it was (and remains) a very particular setting, shaped by the contingencies of one person’s working life as it had evolved over many years. Insofar as artists’ studios really are special, mysterious places, it is because of this particularity. This is rarely reflected, though, in the photography and journalism that surrounds them. Rather, studios tend to attract attention according to how well they embody a particular conception of the artist as an outsider, an unconventional or even otherworldly being. One studio that fits this template belongs to the monk-like painter Frank Auerbach, who has worked in the same dank cell in Mornington Crescent more or less every day since 1954 (Auerbach once quipped that age had finally forced him to reduce his working year, from 365 days to 364). Not only is the room cramped and barely furnished, but to the delight of various photographers over the years, Auerbach’s scraping technique has left the floor coated in layer upon layer of calcified paint. 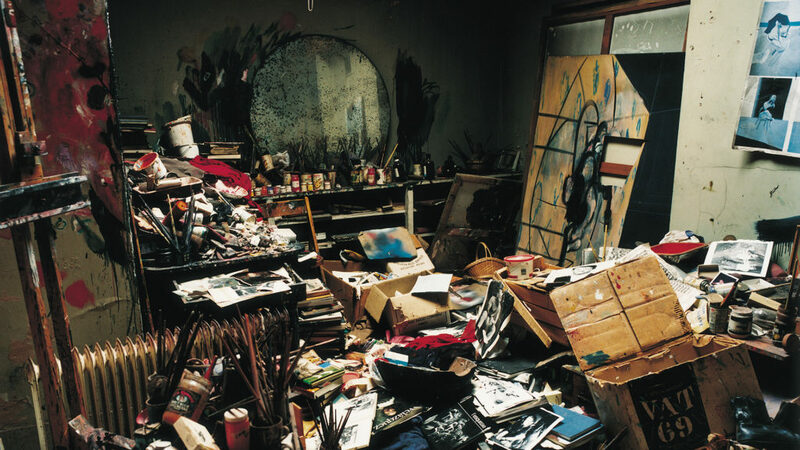 This is nothing, however, compared to the iconic lair of Francis Bacon – a disaster zone that resembled a trash-heap more closely than a studio, and captured perfectly Bacon’s persona as a chaotic, doomed madman. 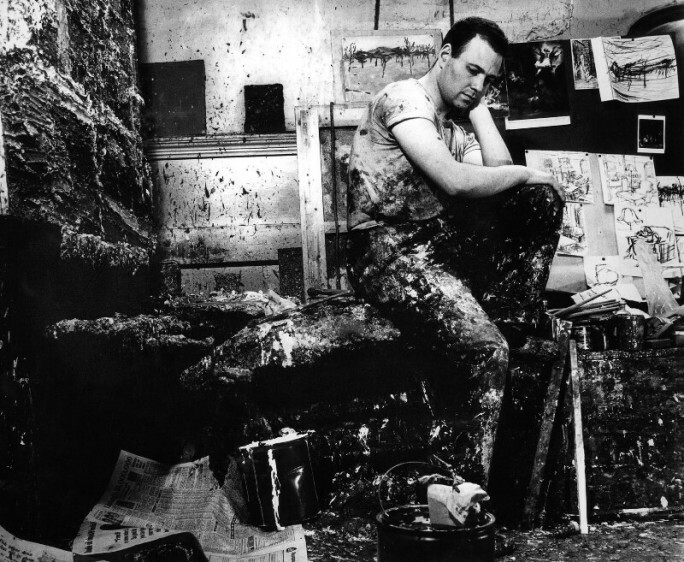 Jorge Lewinski, “Frank Auerbach,” 1965. © The Lewinski Archive at Chatsworth. Far from the details of his daily life bringing nearer to me the nature of his inspiration and making it clearer, it is the whole mythical singularity of his condition which the writer emphasises by such confidences. For I cannot but ascribe to some superhumanity the existence of beings vast enough to wear blue pyjamas at the very moment when they manifest themselves as universal conscience […]. Sometimes artists themselves appear to use this trick. 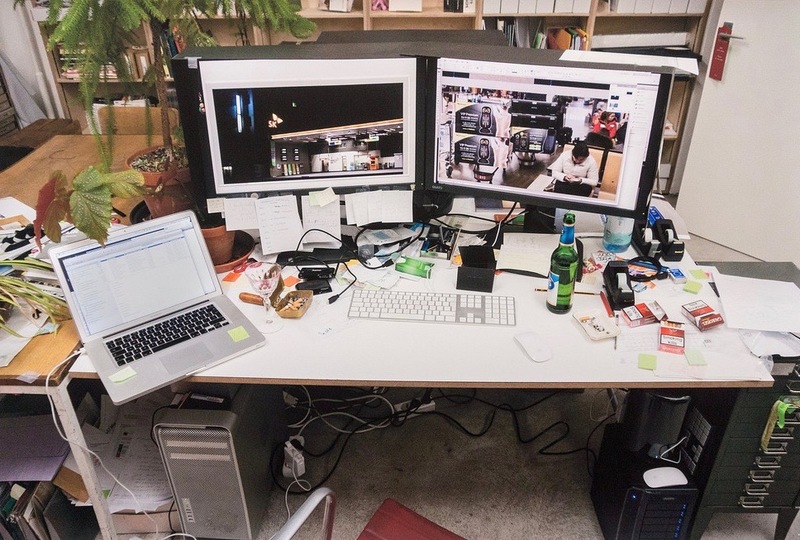 Wolfgang Tillmans’ photograph Studio still life, c, 2014 shows a very ordinary desk spread with several computers, a keyboard, cellotape, post-it notes, and so on. There is just a suggestion of bohemia conveyed by the beer bottle, cigarette packs and ashtray. It is tempting to interpret this image, especially when shown alongside Tillmans’ other works, as a subtle piece of self-glorification – a gesture of humility that makes the artist seem all the more remarkable for being a real human being. We shouldn’t be too cynical, though. The various romantic tropes that surround artists are not always and entirely tools of mystification, and nor do they show, as Barthes suggested, “the glamorous status bourgeois society liberally grants its spiritual representatives” in order to render them harmless. Such “myths” also offer a way of pointing towards, and navigating around, a deeper reality of which we are aware: that artistic production, at least in its modern form, is a very personal thing. This is why we will always have the sense, when seeing or entering a studio, that we are intruders in a place of esoteric ritual. As I said, the beauty of a studio lies in its particularity. Does this mean, then, that one cannot appreciate a studio without becoming familiar with it? Not entirely. I was recently lent a copy of the architect MJ Long’s book Artists’ Studios, in which she chronicles the numerous spaces she designed for artists during her career. These include some of the most colourful and, indeed, most widely mythologised studios out there. But as an architect, Long is uniquely well placed to tell us the specific practical and personal considerations behind them. As such, she is able to bring out their genuinely poetic aspects without falling into cliché. Kitaj, scholar-artist worked surrounded by books and the works of his friends. In his studio books lie open on the floor at the foot of each easel like paving stones in a Japanese garden. Blake works in a sort of wonderland mirroring and embodying his magical mystery world of icons that feed into his imagination. A dance photographer required a pure vacuum charged with light but no physical sense of place whatsoever. Auerbach’s studio is the locked cell of the dedicated solitary. Ben Johnson requires the clinical conditions of the operating theatre shared with meticulous operatives in a planned programme of execution.